"My neighbor made this dish at a barbecue and I had to have the recipe. It is so easy and you will be surprised what a wonderful flavor the peaches give to the chicken!" Preheat grill for medium heat and lightly oil the grate. Season chicken breast halves with salt and black pepper. Stir peach preserves, olive oil, soy sauce, garlic, and mustard in a bowl; season with salt and black pepper. Reserve about 1/2 cup peach sauce. Place chicken on preheated grill; cook until golden brown, 6 to 7 minutes, then flip chicken. Continue cooking for 5 to 6 minutes. Brush both sides of the chicken with peach sauce. Cook until no longer pink in the center and the juices run clear, 4 to 5 more minutes. An instant-read thermometer inserted into the center should read at least 165 degrees F (74 degrees C). 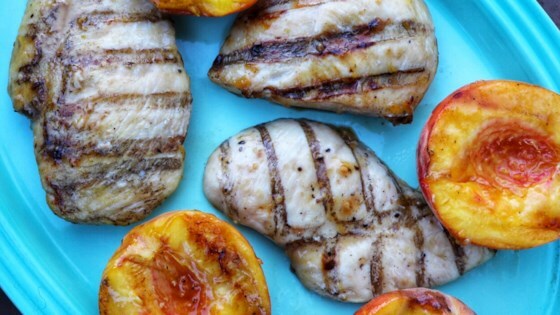 Arrange peach halves cut side down on the grill. Grill for 2 minutes, flip, and brush with reserved 1/2 cup peach sauce. Continue to grill until peaches are tender, 3 to 4 minutes more. Delicious! Will definitely make again soon. Update: We did have this again and it was still delicious! Quick and easy recipe that will impress your guests. Since I had some apricot jam left in jar, I used instead of peach. Apricot and garlic were so nice! This was super yummy. The peach sauce is so good. I bet it would also be good on a pork tenderloin. I will definitely be making this again.